You could… with the NEW EQ 7, coming out in June! The Electric Quilt Company is going to randomly choose 10 bloggers to host a give-away in May. You could win a FREE copy of EQ7! But if you don’t win, you can still pre-order your own copy at a special promotional price through May 31st. I can’t wait to see it! Look at all these new features. If you’ve landed here from a far-away link, please continue on to THIS POST to enter my give-away for your own copy of EQ7. § 13 Responses to Do You EQ? I missed the EQ6 upgrade so it looks like I’m just in time for EQ7! Our Mac is always wanting to re-boot in Windows. I like to think it’s trying to tell me to use EQ more. This time I really want to have it. Thanks for sharing it. I wish, I wonder how they randomly pick 10 bloggers? I’d really like it, but not likey to happen unless I win a copy. How fun! I EQ a bit but I really need to make a bigger effort to learn more about the program to really make it work for me. I have EQ5 right now. I have EQ6 and haven’t really taken the time to find out about all it’s new features yet – I’m discovering new things and having a-ha moments constantly – great fun! And there’s a new version already? Wow, I expect I will find out that I need it sooner or later ;- ) I must go and check it out! I don’t EQ but I would love to learn. Thanks for a chance at winning. Congratulations. I see that you won on the EQ Blog. now maybe I can win the one you will be giving away. WOW! How fun! I just started following you the other day after seeing your Dear Jane flickr photos. Inspirational! 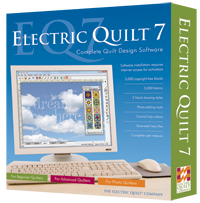 EQ7 looks like a must have for any quilter who owns a computer……..imagine the possibilities. You are currently reading Do You EQ? at Bloomin' Workshop.